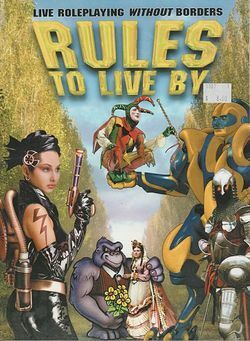 Rules to Live By (RTLB) is a game system designed for Theater Style Games. It was published by Interactivities Ink in 2001. The system is intended to be universal, able to represent any genre, and is aimed at allowing players to build their own characters using a points system to purchase statistics, skills, resources, and handicaps. It uses dice or finger-flings for random resolution. The core book includes character templates and a sample adventure, "Team Adventure". A LARP Pocket Player's Guide was also produced to provide a handy reference to the system. A second book, Rules To Live By: Supernatural, was also published, detailing rules for adding supernatural characters and occurrences. Two classic larps were published for the system: Final Voyage of the Mary Celeste and Marin County New Age Society Cocktail Party. This page was last modified on 11 January 2017, at 21:18.